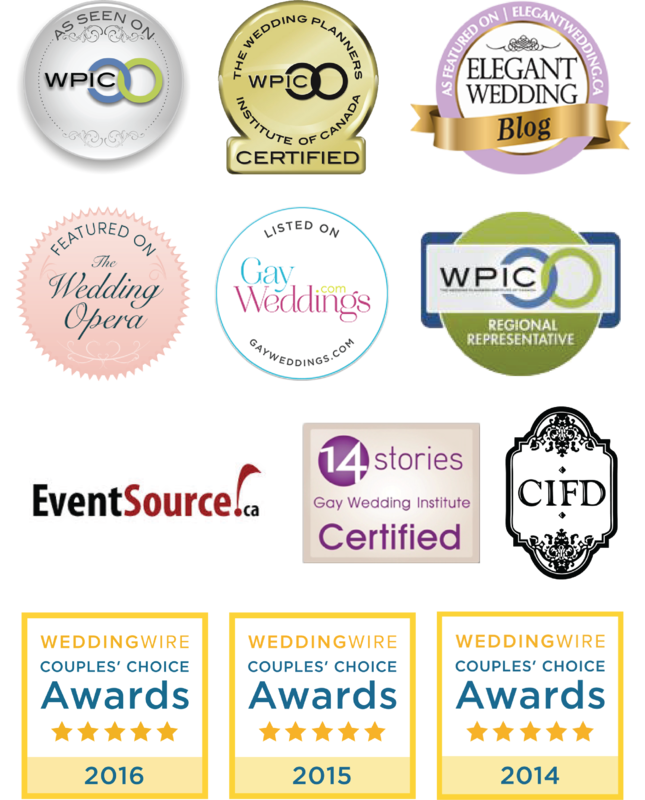 Certified with The Wedding Planners Institute of Canada & 14 Stories Gay Wedding Institute, we provide full/partial wedding planning and wedding day management to all couples in the Greater Toronto Area, cottage country, and beyond. We can assist you every step of the way from budget development & management, selecting a venue & vendors from our “preferred vendors list”, vendor meetings & contracts, theme development & decor, wedding flowers & wedding day management, to ensure the most important day of your life runs smoothly and stress free. Whatever your needs, we have a Service Plan for you. We also offer our clients Wedding & Event Flowers. Certified by the Canadian Institute of Floral Design we can create beautiful bride bouquets, Bridesmaids & toss bouquets, boutonnieres, corsages, flower girl pomanders, baskets, floral crowns, ceremony flowers, reception centerpieces & decor. We service: Toronto/GTA, Mississauga, Brampton, Caledon, Pickering, Ajax, Whitby, Oshawa, Bowmanville, Courtice, Peterborough, Kawarthas & Muskoka, Klienberg, Kettleby, Markham, Oakville. You have planned your wedding but would like to enjoy your day without worry! This package includes an in-person consultation 1 month prior to your wedding date (1-2 meetings). Confirm details with venue and vendors 1-2 weeks before wedding day. It will commence upon the day of the Wedding Rehearsal and end at the conclusion of the Wedding Reception. Setting out necessary items such as: guest book, seating chart, seating cards, favours, etc. Providing you with peace of mind and a stress-free Wedding Day that you worked so hard on! So you can ENJOY your Special Day! FCL has been successfully planning corporate events for large companies in the GTA. Everything from design & theme development, decor rentals, furniture rentals, floral designs, set-up & tear down for Sales Meetings, Holiday Parties, Fundraisers, Trade Shows, Golf Tournaments, Retirement & more. Custom Wedding Packages Available Upon Request! For more information about our Weddings and Events, please Contact Us today! Check our Wedding Flowers & Decor page!